How big will this year's crop be? It depends upon who you ask, but they're all close, and agree this year will be larger than past years, maybe a record. The U.S. Apple Association's estimate of the size of the 2014 United States apple crop is 263.8 million bushels. The USDA's August 12th estimate was for 259.2 million bushels. That would be a 6% increase over the 2013 crop (which was 248.6 million bushels), and a 16 percent increase over the five-year average (227.7 million bushels). If the estimates hold, 2014 will produce the third-largest crop in U.S. history (the top crop - 277.2 million bushels - was in 1998). Fruit Grower News reported that the US Apple Association announced that the 2013 U.S. apple crop was about 248.6 million bushels (the August 2013 forecast was for 243 million bushels). That's a 15 percent increase over 2012's final crop of 215 million bushels, and a 11 percent increase over the five-year average (224 million bushels). It's the largest crop since 2004, according to USDA numbers. The price range for apples wholesale (such as at large real farm markets and at orchards) was between $15 to $30 per bushel, depending upon the variety and location. Popular varieties, like Gala, Fuji, Honeycrisp, etc. were around $22 - $26/bushel (wholesale). Who are the top apple producers? Fresh apples appear in grocery stores all year round now, thanks to a global marketplace, but the northern hemisphere's apple season is typically from as early as July to as late as November. The peak of the apple season is September and October. So where do apple come from the rest of the year? Some (not all) varieties of apples store very well, and will keep for months in storage warehouses that maintain th eproper temperature and humidity. That extends the season until 6 months later (March / April) when apples from the southern hemisphere are in season. Which means that from March to July fresh apples in U.S. grocery stores come from the southern hemisphere, mostly from Chile and New Zealand. That accounts for about 6% of annual U.S. apple consumption according to the U.S. Apple organization. Two-thirds of the U.S. crop is eaten fresh and one-third goes to processed uses (apple juice, applesauce, apple butter, packaged apple slices, etc.) Apple varieties change over time. 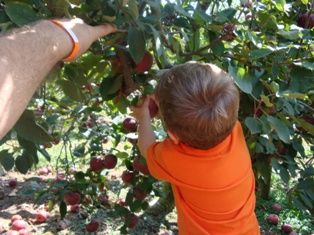 Red Delicious is still the most grown apple, making up most of the U.S. apple crop, but as consumer tastes shift, apple growers adapt their orchards, but trimming the trees down to a main trunk and several large branches, and then grafting growing tips of the new variety into those remaining branches. This allows growers to quickly (within 2 years) produce the new variety to meet consumer demand. Want to Grow Your Own Apples? I do and it's easy and fast. Apple trees I planted in my yard two years ago are bearing several dozen fruit each this year! Here's a guide to selecting a variety to grow and how! Other Apple Facts and Fun! China is the leading producer of apples with over 1.2 billion bushels grown in 2001. The U.S. is number 2 .